A 30 year old unemployed man accused of attempting to murder two police officers in Ealing has been remanded in custody after hurling abuse at the judge from the dock. John Paul Onyenaychi, 30 from Stratford, is charged with stabbing Pc Paul Madden, 23, and Piotr Dolata, 27, a police community support officer, on Wednesday. 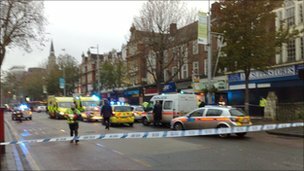 The two officers were injured at a bus stop in New Broadway in Ealing as they were helping check tickets. It emerged today that Pc Madden was saved by a passing retired surgeon, who gave him emergency treatment moments after the attack. Onyenaychi, was also charged with attempting to cause grievous bodily harm against a second PCSO, Steven Constable. At Brent magistrates' court, Onyenaychi refused to confirm his name, date of birth and address before launching into an expletive-filled tirade. District Judge Coleman ordered he be taken back to the cell and the hearing continued in his absence. 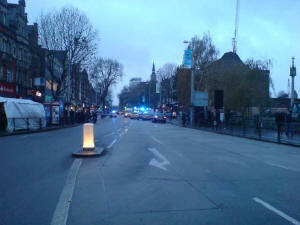 Contact your local SNT or call the incident room on 020 8721 4205.